Living in Romania you’d never know there was a country next door called “Ukraine” that covers half of this country’s borders. Unless there’s a fistfight in the parliament* you almost never hear about what’s going on there. Lately though Ukraine’s been in the news because of the ongoing protests, boiled down in black and white as the “evil” pro-Russia government of Viktor Yanukovich versus the “good” pro-European bloc of the people and that’s why there are tens of thousands of people that have been in the streets of Kiev (for 26 days now), the capital. 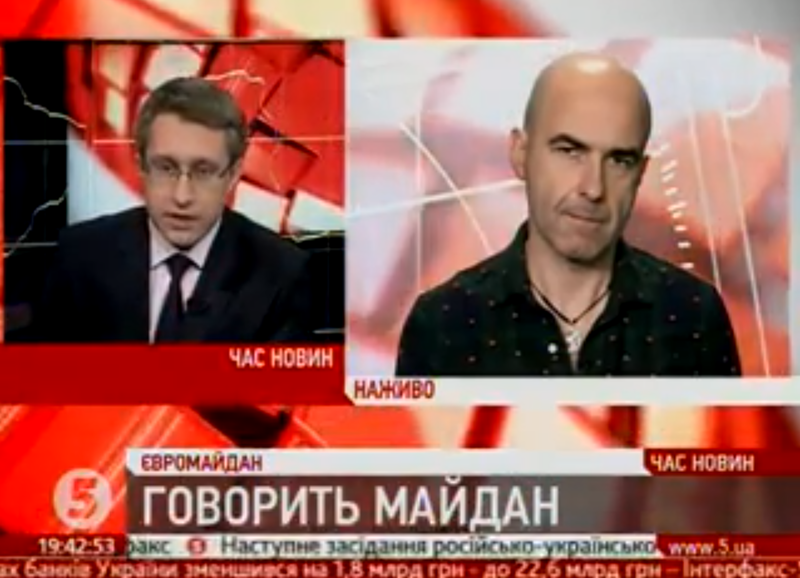 This got me into watching one heck of a lot of Kanal 5, self-described as first in delivering the news out of that country, 90% of it in the Ukrainian language. Usually when someone’s on television speaking Russian they don’t bother to translate it but otherwise the news reports are all in Ukrainian. I have to give Kanal 5 serious credit for hosting very democratic forums on the issues brought up by the protestors, forums in which the various participants are given plenty of time to express their views. I’ve always thought similar forums in Romania (primarily just on TVR but also Transilvania L!ve) were excellent demonstrations of true democracy at work. Too often in countries like Britain and America the only political “debate” you see on television (the modern public square) are shoutfests between “experts” brought on camera to spew out quotable soundbites. Despite all the hooplah of the “pro-European” protestors, a kind of combined demonstration of Europhilia and general disgust with the current government, today I got to watch a simulcast of Ukrainian president Yanukovich speaking in Russian as he sat in Moscow at a table alongside Vladimir Putin, whose government had just agreed to a number of trade and investment deals with Ukraine. It looks like Ukrainians will be staying toasty warm this winter with (now cheaper) Russian gas. This after American senator John McCain showed up on stage in Kiev to give a speech (in English) siding not just with the anti-government protestors but also seeming to endorse the Svoboda party because of who McCain was standing with on stage. As usual with Ukraine, the Polish government has been heavily involved in pushing their own agendas and the Polish news channel TVN 24 has been doing regular dispatches from Kiev. For all the talk of Russia “interfering” with internal Ukrainian politics, it’s pretty clear that the “west” is doing plenty of interfering as well. The story is far from over, of course, as the protestors are still in the “maidan”, the Ukrainian word for square (Ro: piata) that originally comes from the Persian. It’s the same root word for maidanezi, the Romanian term for stray dogs, meaning “dogs from the public square”. I’ll definitely be continuing to watch events unfold as they happen but I think it’s a real disservice to the Romanian public that there is so little information or discussion about their giant neighbor next door. * One of the things still remaining on my “bucket list” is to give a speech on the floor of the Ukrainian parliament and then punch a guy in the face. It’s the same root word for maidanezi, the Romanian term for stray dogs, meaning “dogs from the public square”. Cuvantul “maidanez” ca denumire pentru cainii vagabonzi avea initial un sens peiorativ si era oarecum hilar. Acestea s-au tocit prin utilizare frecventa. Ideea era ca atunci cand intrebai ce rasa are cainele, raspunsul era “maidanez”, similar cu “pechinez”. O alta expresie legata de cuvantul maidan, pe care am auzit-o foarte putin in ultima perioada si care are de asemenea un sens peiorativ, este “FC Maidan”. Ea se refera la jucatorii amatori de fotbal care practica sportul pe diverse terenuri mai mult sau mai putin amenajate. Doar o mica observatie, in limba romana maidan are sensul de loc viran, de regula situat la marginea unei localitati. Deci, nu sensul de piata (loc central), ci dimpotriva, un loc periferic dintr-o localitate.